The cars described here represent the first Mercedes models for many years to have gone straight from current model to admired classic without the usual “old fashioned car” stage in between. It is a tribute to their superb design, build quality and timelessly elegant styling that they have done so. In our view these cars come from a golden era for Mercedes-Benz, where three rising curves of innovation intersected with a falling curve of quality, leading to the production of cars with such a high standard never achieved before or since, nor likely to be in the future. The first rising curve is that of active and passive safety. Mercedes-Benz have always been pioneers in this field, with many innovations patented in their name. The eighties was the decade during which many of the safety features we now take for granted became widely available on Mercedes cars. These include ABS, airbags, seat belt tensioners and advanced crumple zones. The second rising curve is quality of rustproofing. Prior to the eighties, rustproofing in the factory was limited, and though Mercedes-Benz were still building some of the best made cars in the world, they did suffer corrosion like any other as they got older. In the early eighties all that changed with the introduction of galvanising and advanced protective coatings. This may explain why there are so many otherwise scruffy and neglected 1980’s Mercedes saloons still chugging around with hardly a spot of rust on them. The third rising curve is that of engineering innovation. Cars of our favoured era achieved a level of reliability and economy never before seen. This curve has continued to rise since then, but sadly some of the complex electronic aids and weight saving measures introduced more recently have caused later models to be more troublesome and less durable. The final and, sadly, falling curve is that of production cost control or “Value Engineering” to give its polite term. The R107, W124, W201, W140 and R129 were the last models made by Mercedes-Benz where cost accounting was subordinate to engineering quality. Since then the accountants have held sway, and all but the most expensive of later models have aimed for cut-price volume sales at the expense of absolute quality. One cannot blame Mercedes-Benz for this, as the industry was changing fast with ever more pressure to drive costs and new car prices down. In the face of this the company has increased sales phenomenally and the business has gone from strength to strength despite ever fiercer competition. 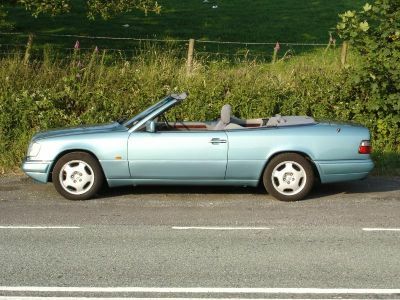 It has however made the later models far less exclusive (try counting how many modern Mercedes you see next time you are on the motorway), less durable and far less satisfying to own. As a combined result of all these factors it is quite usual to find customers forsaking their recent Mercedes models to revert to the older but more satisfying predecessors, especially when they have previously owned the earlier models from new and are able to compare like for like. Another bonus of this is the way it enables a neat sidestepping of the crippling depreciation suffered by all the new models. This is largely a result of the huge increase in availability of recent model used Mercedes cars caused by the relentless drive for sales volume by the dealers. The recent phenomenon of the PCP (Personal Contract Purchase) has skewed the ratio of new to used car sales and disguised this depreciation by the clever use of figures and obsession with monthly payments. There is however no doubt whatsoever that the customer is still paying it. A huge increase in the amounts borrowed by already indebted households in Britain and the US to buy new vehicles is fuelling fears that “sub-prime cars” could ignite the next financial crash. British households borrowed a record £31.6bn in 2016 to buy cars, up 12% on 2015. Nine out of 10 private car buyers are now using PCPs, which have boomed since interest rates fell to historic lows.